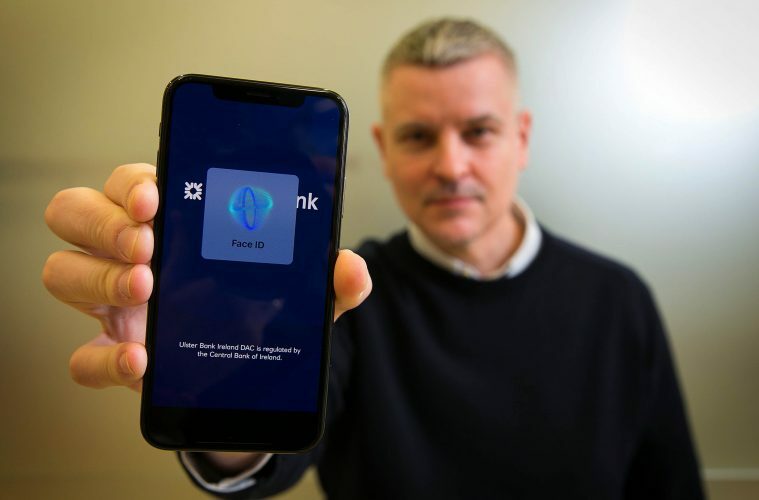 Ulster Bank has become the first bank in Ireland to enable customers to access a banking app using Face ID, the facial authentication feature exclusive to Apple’s new iPhone X. Customers who download the latest update to the Ulster Bank app will have access to this technology. Like Touch ID, which Ulster Bank was the first Irish Bank to make available to customers in 2015, customers can still choose to login using a PIN, if they prefer. Face ID provides secure authentication to allow users to access mobile banking services. A state of the art camera captures accurate face data by projecting and analysing over 30,000 invisible dots to create a depth map and an infrared image of the face. Face ID adapts to changes in the user’s appearance e.g. glasses or a beard, and can be used outdoors, indoors and in complete darkness. Ulster Bank has seen an increasing number of customers opting for mobile and online banking, and has invested in digital accordingly. 60% of its over 400,000 daily customer interactions are digital, and 59% of accounts are ‘paperless’. 2016 saw a 22% year on year increase in mobile banking. – Save low value payee details and delete payees without having to go into Anytime Banking. – Make future dated transfers (Android only). – Remain Logged In – When customers leave the app it will remain on for a number of seconds rather than forcing the customer to log in again. – Credit card servicing to allow customers to increasingly “self serve” rather than calling the credit card centre or accessing credit care. This will allow customers to manage their credit cards easily and at a time that suits them. – Customers will be able to unblock their credit card PIN and request PIN reminders in-app. – For business customers: ability to add different business accounts in the same mobile session by adding multiple Direct Banking ID/Customer Numbers to the mobile banking app.